Click to Adopt a Bed! 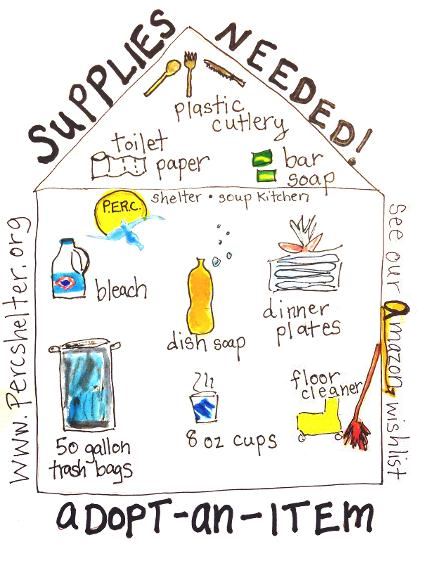 CALL FOR SHELTER & CLEANING SUPPLIES! We are now serving 250+ meals a day & sheltering 140+ homeless individuals a night. You can play an active role in our work by donating urgently needed items - order directly from our Amazon wishlist, or drop off at our shelter/soup kitchen entrance at 111 37th Street in Union City any day of the week! Palisades Emergency Residence Corporation exists to defeat the cycle of poverty, understanding that food and shelter are fundamental human rights. PERC believes that with help, there is hope. We believe that every person deserves dignity, respect and opportunity. PERC achieves our mission by providing emergency shelter, a day program with access to housing case management and support services, permanent housing for chronically homeless individuals, outreach in the community, a soup kitchen and food pantry. Since 2013, PERC has been a subsidiary of Garden State Episcopal Community Development Corporation, a non-denominational, 501(c)(3) non-profit organization whose mission is to create healthy neighborhoods in the Hudson County region through community development initiatives that cultivate the resources of residents, businesses, government and the faith-based community in serving those most vulnerable in our society. Our shared goal is to acheive safe, secure, permanent housing for all.